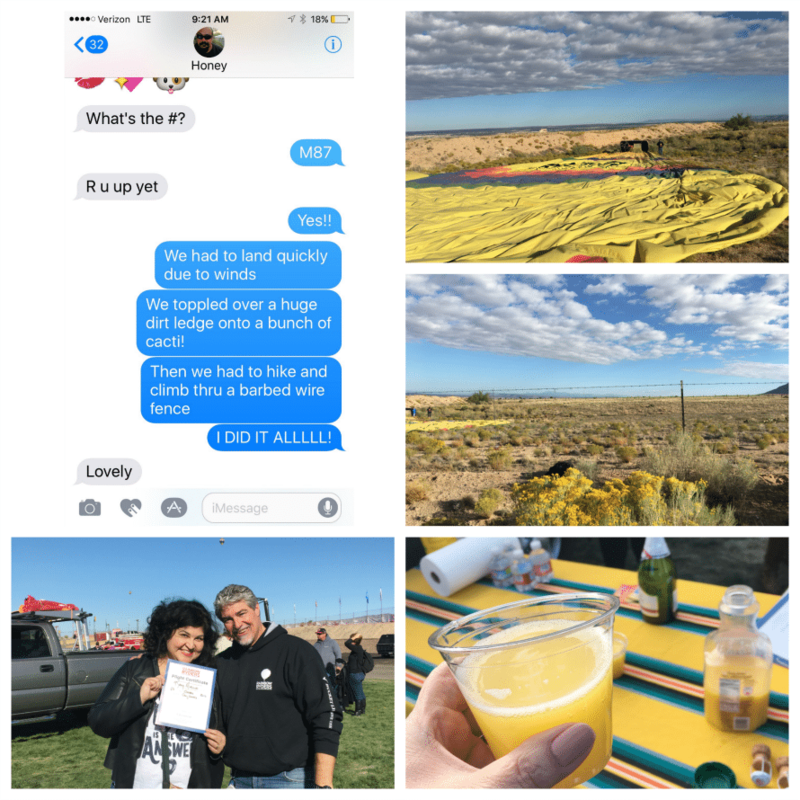 I crashed in a balloon ride – and loved it! 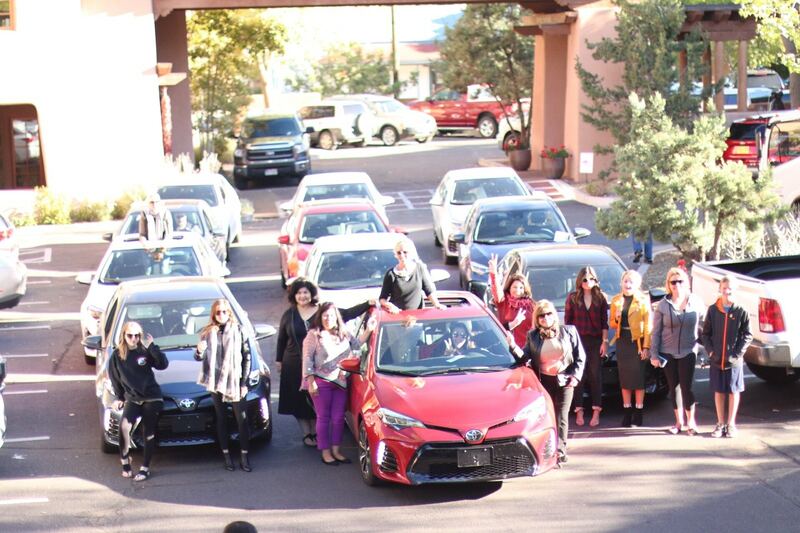 Last fall a public relations firm here in town reached out to me with an invite to attend an all-expenses paid road trip to New Mexico celebration in honor of the Toyota Corolla’s 50 birthday. I love birthday parties! And I’d never been to NM, a visit has been on my wish list for years. 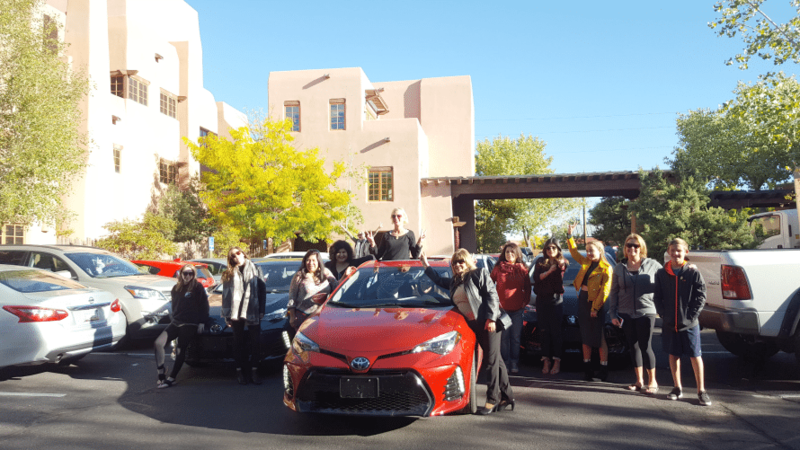 The trip included a brand new 2017 Corolla for the week and a drive to Santa Fe for sightseeing and Albuquerque for the Balloon Fest. Here is the set of wheels I borrowed for a week. The mileage counter was set at SIX, as in 06! For the rest of this car’s long life, I will be the first one to have taken it on a trip! 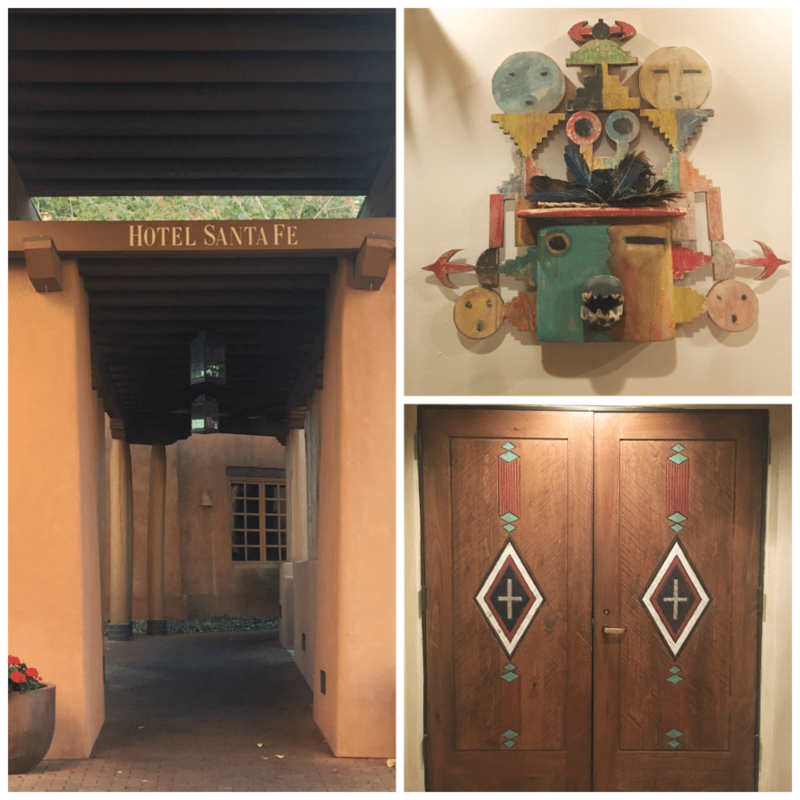 Patrick and I joined about a dozen other online influencers and we all departed our personal driveways and headed to the Hotel Santa Fe. This worked perfectly because we could feel the spirit of the city at this downtown landmark. I loved that they had a complimentary happy hour with gourmet cheeses, wine and beer every day! We needed it after all the things we did. 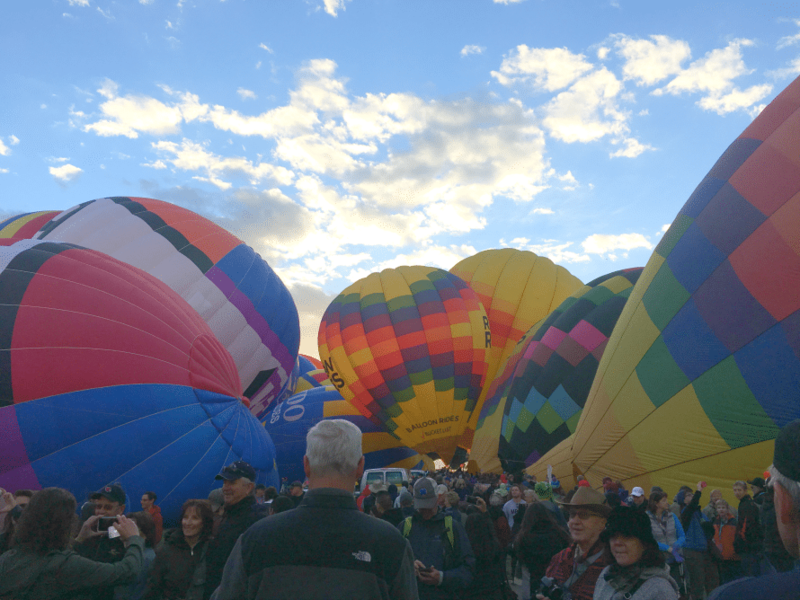 The next morning we woke up at 3 a.m. and headed out to the 90-minute drive to the Albuquerque International Balloon Fiesta which is held for nine days every October. I assumed we would visit a park and take off from there, but come to find out, this fiesta is quite epic. When we arrived at 5 a.m., massive crowds had already flooded the areas, much like the state fair on a Friday night. 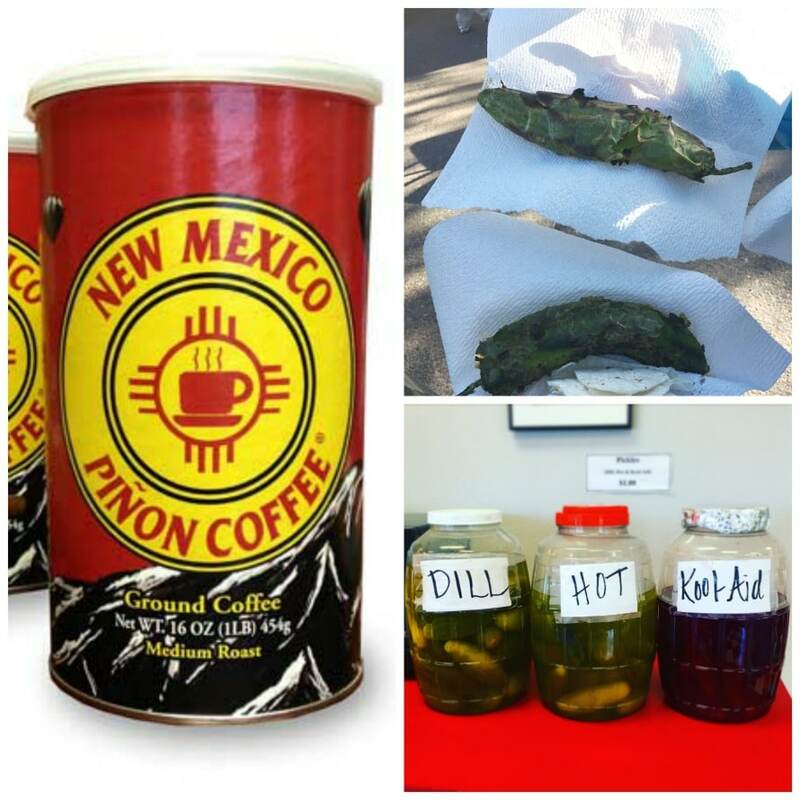 Food vendors serving green chile stew and pinon coffee, live music on various stages and art and craft vendors. At 5 a.m. on a weekday morning! The sun hadn’t even rose yet! Don’t believe me? Here is my friend, Sandra Munoz from Latinaology doing a little early morning shopping before our ride! 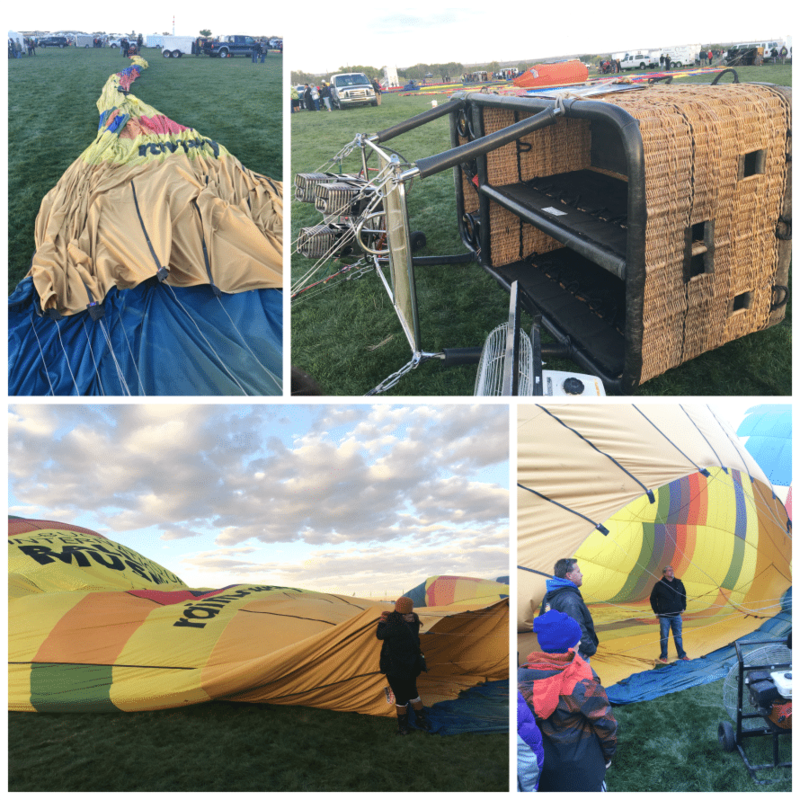 6 a.m. arrived and we needed to head over to the balloon. I had already agreed to ride, but Patrick didn’t (he doesn’t like heights). 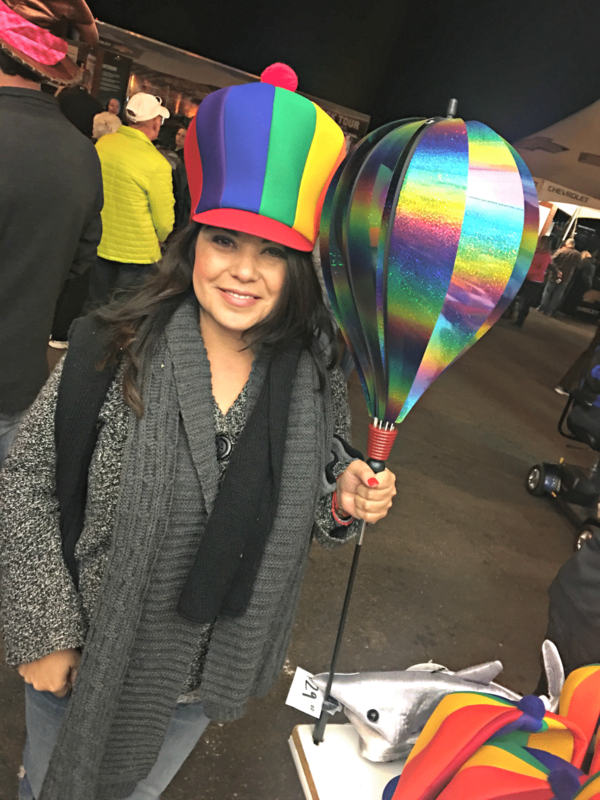 I’ve always been the type to try anything once, even if it freaks me out, so on I marched with my group. 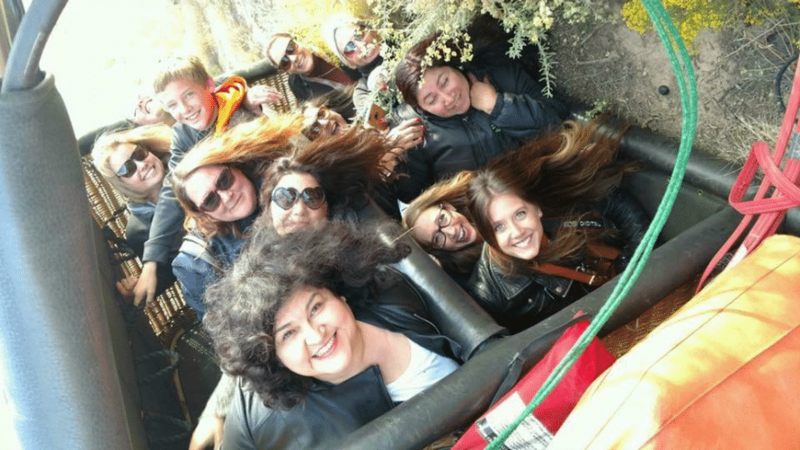 OK, so about this balloon ride. Everything felt cool and chipper until we walked across the giant park to our designated launch pad. Then I noticed people talking to each other, something wasn’t right. None of the balloons had started to fill up. Our pilot gathered us close and explained the weather had to be perfect in order for him to take the chance of leading us up. With 20+ years experience, we didn’t question him. He told us to hold on and and see if the conditions would change. At this point, a little bit of guilt settled in my chest. I have this way of manifesting things now and then. We all have the capability! I’m not saying I caused the weather to act up, but I don’t think my “Please cancel this” thoughts helped it either. I seriously started to feel anxious, biting my nails and pacing about. We didn’t have cell reception, so I couldn’t even reach Patrick. I had to make up my mind quickly if I’d proceed. About an hour later we received the all-clear. I concluded I didn’t want to go. I gasped in awe. How could I NOT be a part of this? Balloons started to fill. You can’t really comprehend the vibe from this photo, but this scene was such a majestic sight to witness! I knew I had to push through my silly fears and that everything would be just fine. I inhaled, and mentally calculated a strategy to climb up the side of the basket and hoist my thick body in. 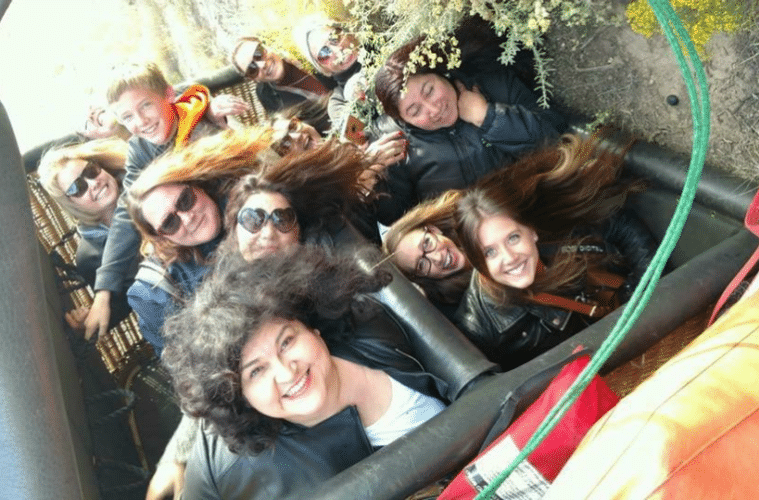 Then the attendant told us (while looking directly at me) that as soon as the team started to fill our balloon – two people could slide in while the basket sat on its side, then the crew would stand it up and the remaining ten riders could climb in. My arm shot up over my head. “I volunteer!” I shouted a little too eagerly for our small group. So did this one girl’s mom. I was among the two oldest riders and we inserted ourselves, baby style. Ol’ lady style. WHATEVER. No cares, for the first time ever, I was more than happy to volunteer as the elder tribute! “Oh, oh, oh!” I said as I raced over. I thought I jumped in like a ninja on caffeine, but I guess to them it may as well have been slow-mo. “FASTER!” they yelled. I scooted in, crooked, but I made it. Right at the front so I could be closest to the pilot. Smart, huh? I whistled to the air, gripped the handles and pretended I didn’t hear then men groan and grunt and say, “WE NEED ONE MORE MAN TO ASSIST, HEAVY LOAD!” as they heaved the basket upright. The other riders filed in, and we lined up like 12 sticks of gum, tightly packed in a straw case. And…up, up, up we went, in time with the sun rising, soaring into the sky like it was meant to be. 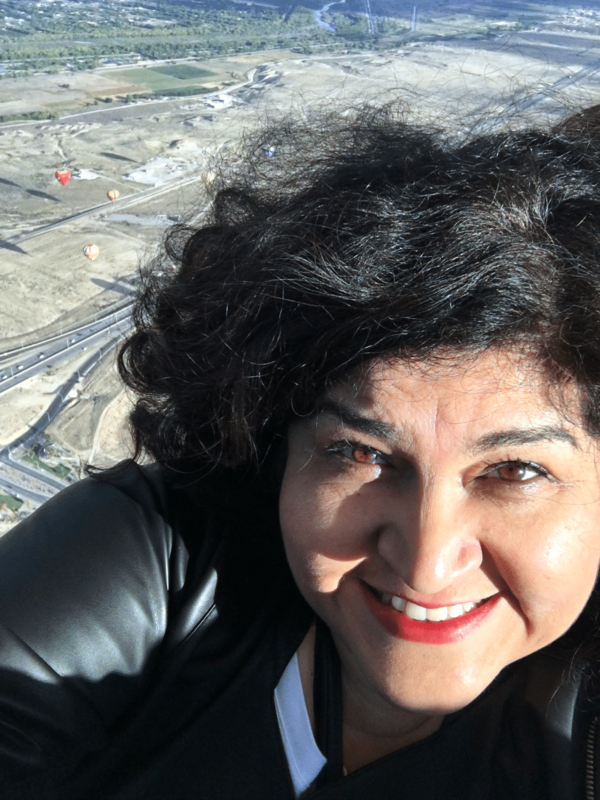 I held the basket’s inside handles tightly, but did break away to grab a selfie. Because that’s what I do, right? I needed to document this moment to remind my future self to push past my self-doubts. Man, I’m so glad I didn’t miss out on this experience! If you notice, I do look a bit terrified, but still happy! I’ve felt peace before, but this time I could actually see it. I refused to stress out. He calmly announced the news to our group, and then searched for a spot to land. I followed his eyeline and only saw a large patch of rocky desert terrain. I looked around and noticed all the balloons around us were quickly descending. One of them even landed in the middle of the highway! That was when I closed my eyes and said a prayer. I opened my eyes when our pilot said, “Hold on we’re going down, and we’ll likely crash.” Below was a smaller patch of cactus-filled land, right below a cliff. I held on and imagined myself being one with the basket. I would melt into the straw, no matter what, to stay put in, I would not allow myself to fall out of the basket. We hit the land and began to drag a bit, then we rocked side to side. “We are going to topple to the side,” our pilot said with a patient smile. If we felt any fear, he dared not let it shine through his eyes or voice. That’s when a bag holding something hard and heavy swung and smacked him on the back of his head. Those of us up front gasped. It could have been a movie scene. We crash and our fearless leader is knocked out and we have to fend for ourselves! “Owww,” he said. We all sighed with relief knowing he was still coherent and alert.”Darn those helmets!” he said. I wondered if we should be wearing the helmets! LOL! And we fell over to our side, snuggled next to a giant cactus. Our pilot hopped out and snapped this picture of us! This adorable little boy in our group says, “You can do it, we’ll hold your stuff!” And through the grace of God, I managed to slip through the barbed wire without incident. And all my clothes intact! 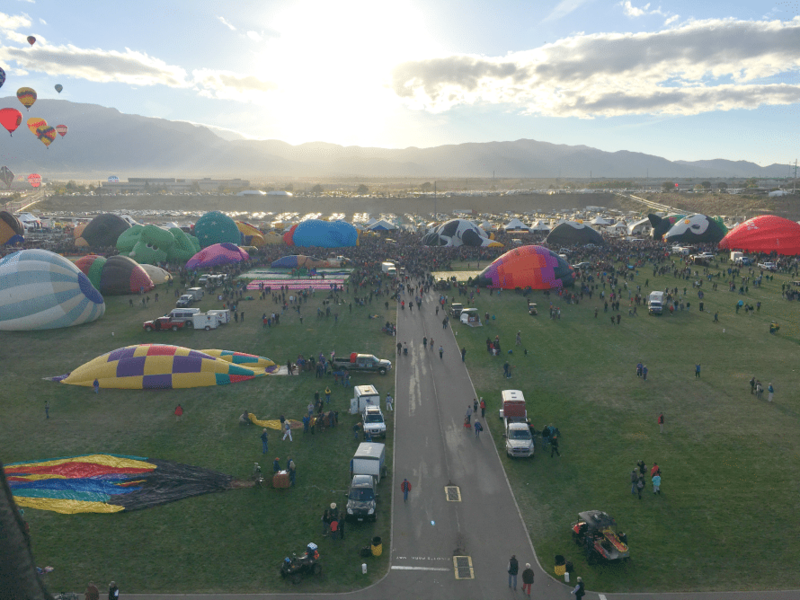 I think I felt more excited about the crash and the barbed wire than I did the balloon ride. Check out my texts to Patrick! A van met us at the crash site and drove us back to the park where we each received a certificate and a mimosa! See why I was excited for free wine back at the hotel? WOW! What a cool morning that was! 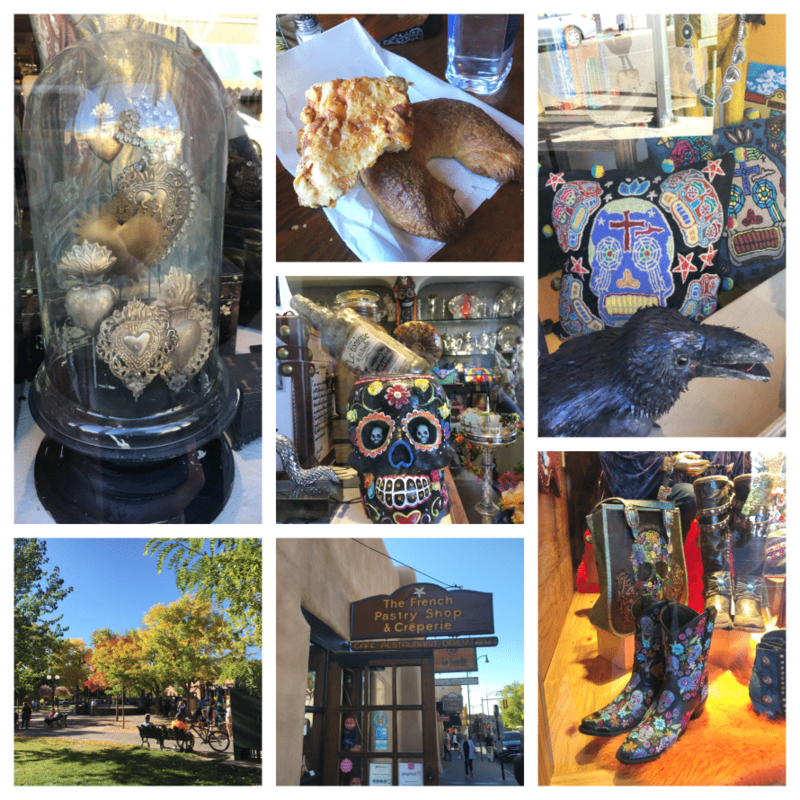 We drove back to Santa Fe, showered and went shopping downtown. I definitely want to return soon, so many cool things to see and do! Later that night (after the free wine), we all met for dinner at Restaurant Martin for the Toyota Corolla birthday bash and dinner! 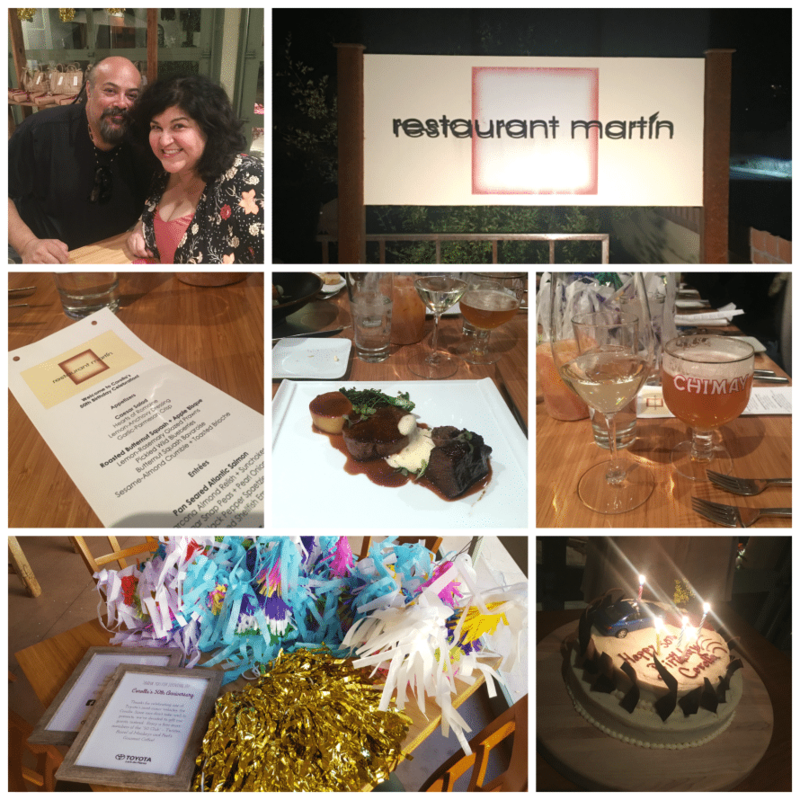 Chef Martin Rios owns it with his wife Jennifer and they create beautiful, decadent “progressive American cuisine.” The place is chic, but also very cozy, it used to be a house! The next morning, we all cruised up with our fancy new Toyota Corollas and posed for pictures! For only being away three days, we sure did a lot – and I met a lot of new friends! I’m so happy and grateful to Toyota for inviting me on this awesome trip! 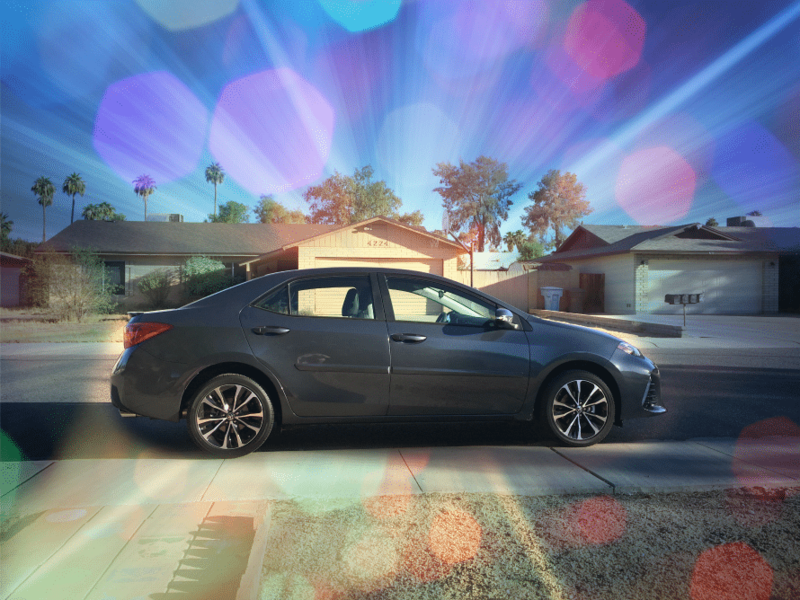 And HAPPY BIRTHDAY to the Corolla, 50 years of style and quality. It speaks volumes when a product stays relevant and reliable like that! On the way home, we stopped at a grocery store to buy some Pinon Coffee (my new fave), and we came across a family selling green chiles, so we kinda bought a huge bag! Then driving home we stopped at a place to eat and they had Kool-aid pickles. I wish I had tried one. I’ll have to make some, because I keep hearing people rave about them. OK, that’s everything, thanks for reading through this long post! Enjoyed your post Kathy! So glad you had a wonderful time in the Land of Enchantment. Santa Fe is my hometown. 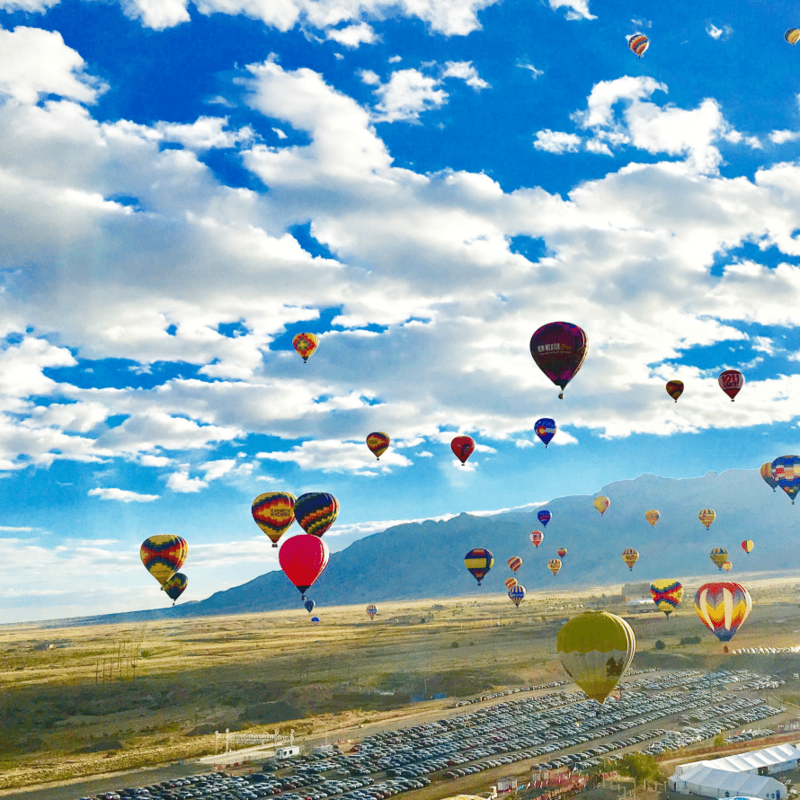 That is so cool – riding “up & away” in a hot air balloon. You are an inspiration, maybe one day I’ll get up in a hot air balloon too? !